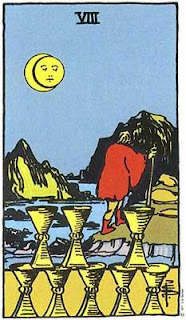 In my 20's and through most of my 30's the tarot card I associated myself with the most was the Eight of Cups. It cropped up a lot in readings, though in different contexts, which -- if you put any credence in that sort of thing -- can change the meaning. It's a card full of disappointments, abandonments, desertions, and disappointments. Cups, as a suit, are associated with water, and, being a Pisces (the most waterful of all the water signs), this appealed to me on multiple levels. Not that I ascribe any particular magic to the cards; if nothing else, I think they tend to reflect the energy of the person that uses them and can sometimes provide murky, if not downright fortune cookie-like guidance to wrangling questions that are probably better answered by detachment rather than focus. Lately, though, The Hanged Man is more in my thoughts. And while I haven't indulged in tarot in more than 20 years, I still find the metaphors meaningful in a sort meta-psychological way. Like many literature majors in recovery, I am a symbol junkie. and because I'm a symbol junkie I know symbolism can be found anywhere, and nowhere -- other than literature, tarot decks, and The Freemasons -- can more symbolism be found than in government. The same is true of the annual count. The annual count is an exercise in futility; for any number of reasons the count is always inaccurate, and generally used as a PR device by the city to trumpet their "responsible" stewardship of city resources. But like most forms of futility, it must be carried out anyway. Local media often frames it as a huge undertaking done by the Coalition to better assess and provide resources to the homeless community. The Coalition doesn't necessarily discourage this view, though it doesn't endorse it, either. At the Wednesday night training, for example, the facilitator stated that the reason for the count was so that the Coalition could have up-to-date numbers for it's annual grant application. This annual grant is worth $10 million. So, basically, as a volunteer for the count, I was there basically as an unpaid census worker. Unpaid... but they WERE going to provide breakfast after it was finished. I went out on a team of 4 with Amanda and two other very nice ladies, one of whom is a regular volunteer with the outreach organization I also volunteer with -- an organization that DOES NOT see any of that $10 million. Our route was a short one, maybe a little over a mile of Bardstown Road. This was an advantage. We would be able o scour a relatively small area pretty thoroughly. This was also an advantage, because it's a route Amanda and I went out on often on weekly outreach... so it's one we already knew. This would help not only because of time -- we pretty much had from 4am to 6am -- but because the overnight/early morning temperature was -5. Amanda and I decided it was best to leapfrog the area. Park, walk a few blocks and look for people, then circle back to the car and drive up to the furthest point we walked. This would keep up near the car, and allow us to keep warm. Our partners appreciated our plan, though initially thought we were being a little silly since our route was "only about mile." We made our way up and back, up and back, and up and back. Walking in the cold reminded me of my time on the street in Chicago -- which makes me both love and fear that city with a symbolic and mystical equity. Other than the 4am staff at Cafe 360 and one guy who was couch surfing (so, by definition of the grant, not technically homeless) we didn't run into anyone. I was glad, too. And so was Amanda. It was too cold and that stretch of Bardstown Road is too far from resources to be there in that weather. But we also knew that if anyone was on Bardstown Road, it was not going to be in that area, which is all business and residential. Our section from Bonnycastle to Winter Ave was a high traffic area during the day and prime panhandling real estate; but even the homeless don't always live where they work. We are, after all, a nation of commuters. After we finished and went back to the hotel, we checked in and left our partners to the provided breakfast -- which, we had already heard, included some very suspect eggs. Before Amanda took me home and went to work, we had time to grab breakfast at Waffle House where the eggs were not at all questionable and the hash browns were smothered and peppered. portrayed as Judas, The Hanged Man is also associated with Christ and with Odin, both of whom, according to the stories, hung themselves on trees -- one as a sacrifice for all mankind and the other to gain all knowledge and wisdom. 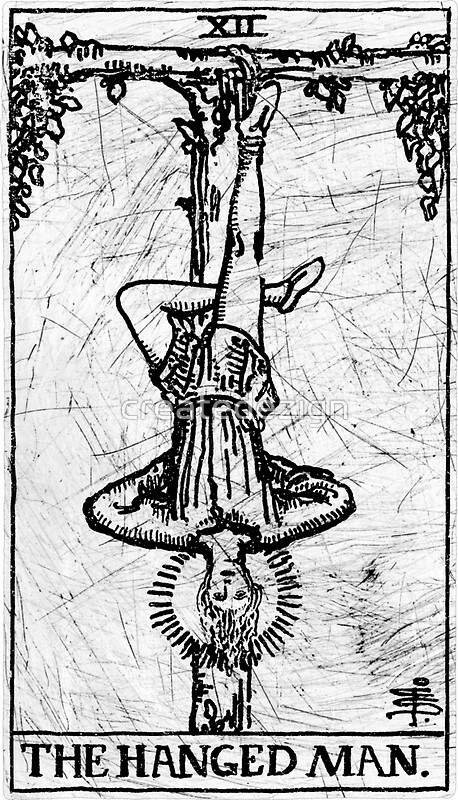 I think of The Hanged Man as maybe the most overlooked, most misunderstood card in the tarot deck that, along with the Death Card, have been woefully abused by movie and television scribblers for years. 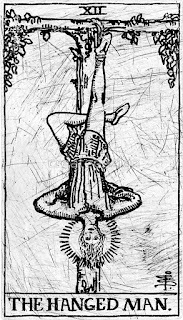 I think of The Hanged Man and I wonder, as the numbers are compiled and fed into the Public Relations machine with the same efficiency that they'll be plugged into the Coalition's annual grant application, who is being betrayed, who is being sacrificed and what wisdom is being gained.